La Coquette: How about that Prada turban? How about that Prada turban? For the record, I love the Prada turban; it’s inherently funny and stylish—my favorite combination—kind of like that one time Amy Poehler went to New York fashion week looking gorgeous and amused. I knew back in October, when I saw Prada’s spring collection, that I had my diary story for the next issue of Chicago Fashion. I would write about the plight of Argentine farmers. Either that, I thought, or hats. I went with the hats. To be honest I’m not a hat person. That’s what made it so fun. When I was wearing the hats, I felt like, “I should have more parties, and paint my wall red, and maybe call that guy who seemed like so much trouble but was appealingly eccentric.” I didn't wind up doing any of those things. But, as can be expected, I got myself into some situations. You can read the story here. I just can't get excited about the turbans. They remind me of how they would always put "women of a certain age" in turbans in the old movies. In fact I remember a funny scene in "Soapdish" with Sally Field: she was an aging soap opera diva competing with all the young ingenues (Teri Hatcher and Elisabeth Shue) and the show's dresser tries to put her in a turban, and Sally just goes ballistic and started screaming about Gloria Swanson or something. The berets seem to be making a comeback here, too, but to me they're much cuter. I do like the hat with the feathers but where would I wear it? Turbans always make me think of that Soapdish scene, too! But I love them anyway -- who wouldn't want to look like Gloria Swanson? I don't even know you but I feel like I hate you - but only a bit. You have such a cool,stylish life; I, on the other hand, fight a constant battle to retain my femininity in a world of men. Thank you for sharing your world with us and giving us a glimpse of chic. We've been dating the onslaught of the "turban" with total abandon at the Fashion Spot and I'll say it here, too: unless you're part of the travel (and financial) elite, strutting the beaches of some incredible Mediterranean sands, with 4 foot long legs and a faubulous maillot to boot....this look is darn near impossible to pull off successfully. Otherwise, it just comes off as bizarre and forced. Ooooh, and Jackie O glasses...perfect with that fabulous maillot (one-piece) and turban. IMO, when worn in an ironic way by a young, cute woman with long hair (such as yourself), it works. On us older gals, not so much. Two words: Mrs. Roeper. You wrote: "I'm not a hat person." In the words of Jane Austen, "an unhappy alternative is before you, Elizabeth." From this day you must learn to embrace all manner of millinery or else relinquish your "coquette" sobriquet. Hats are the very height of flirtation. Nothing proclaims "saucy minx" like a jauntily canted titfer. You simply must add hats to your arsenal. You might draw the line at that ornately plumed black confection, however. Along with a mink stole and a pencil skirt, you would need to accessorize by smoking through a long cigarette holder, which would be injurious to your health! Besides, somebody might accuse you of murdering Colonel Mustard, in the library, with the lead pipe -- very film noir! You wrote: "the hat proves a wonderful attraction for the male species." I trust you on fashion. You must trust me on biology. However quirky, we male Homo sapiens do not constitute a separate species (of course, you knew that). Inserting the words "of the" between "male" and "species" would be an easy fix, perhaps in keeping with the high-society tone of that paragraph. The article was delightful. I loved the writing. I'm only joshing you to show appreciation. Love it ! I liked it in the catwalk but wasn't quite sure it would work on the street. You prove me wrong, it works perfectly ! That is just about the rudest question ever made. NEVER ask a woman this question again. It could get you KILLED. Dude, your hair is all straight! Oh and the turban blows on so many levels. ooooh, tell me more about amy poehler! dp - what's your problem? coquette - you look beautiful, hat or no hat. i love the super complicated hair style you're sporting on the second picture - not to mention the article! dp is not the only male who is getting confused by this season's tunics. The first time I put on my fav new dress from Paul and Joe Sister (http://www.net-a-porter.com/product/21714) , my husband asked why I was wearing my old maternity clothes. But that's why the hats are so perfect- they draw the eye up. "I feel stately and literary like Zora Neale Hurston or Zadie Smith. Inspired, I sit down to write." Hehe. This made me laugh so much. Thank you for such a brilliant article, Coquette. You look fabulous with (and without)that turban. Gee whiz, what have you all got against pregnant women? i love your response to dp's insipid comment. tu mes fais trop rire coquette! Little Edie with red hair! Mark, "Nothing proclaims 'saucy minx' like a jauntily canted titfer." You sir, are delightful. Just delightful! 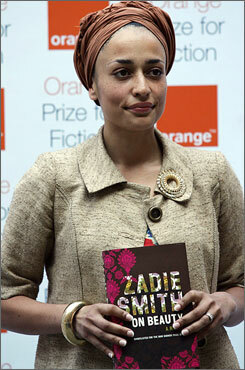 Soroya, I was so happy you liked the Zadie Smith and Zora Neal Hurston reference. It keeps it interesting for me at least. Nice link of Zadie in the turban, thanks. Dp, As I said in my email to you, I can't believe you are a grown man. Umm, not to be a wet blanket or anything, but this isn't going to get funny or clever the more you talk about it. That being said, my improbably skinny arms and legs, and my somewhat short waist which doesn't always photograph well, but which, I assure you, is quite lovely and without child....we have moved on. I applaud you for having the guts to wear a turban out of the house, as I don't think I could do it. I was in a bar here in the middle of the US (where hats are used for warmth, not style) when a young woman walked in wearing a huge white sunhat. It looked really awesome, and I fealt incredibly jealous that I wouldn't have the guts to pull that off. I still love hats, though. Anyhow, I see that this is a sensitive matter. I certainly wouldn't have made my silly remark had I known you would take things quite so seriously. My apologies. I think hats are so cool, both for men and for women. Sometimes, I watch old romantic comedies from the thirties and forties, wishing I could live back then, just because everyone was wearing hats. In Los Angeles, the only women I ever see wearing hats are black women over fifty, who sometimes wear hats to church on Sunday, and I think they look especially sophisticated. I absolutely love the duchesse satin Prada turbans, berets, and headbands. That color looks perfect with your skin tone too. I personally want a beret in black, and I'm a guy. Ahhh if only I had Carine Roitfeld by my side to style me ( http://www.brandish.tv/images/2007/03/27/voguehommes.jpg ) .. then I would have the audacity to walk around Chicago with it on. Fantastic photos. You look better in that turban than half the models. Darling girl, I am off to read your article but first had to express my concern for the straightness of your gorgeous tresses--- subjecting your luscious curls to the merciless flat iron has provoked my defensive mechanism. Second, I am a hat person-- love them. 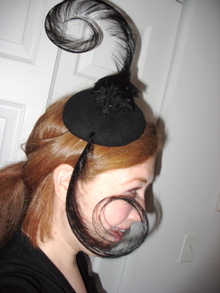 Love to wear them-- my favorite is cloche style . . . bring back the 20's! Dropped waists and low brims . . lubbit. I have to agree with Ms Poppy above -- love the hats. 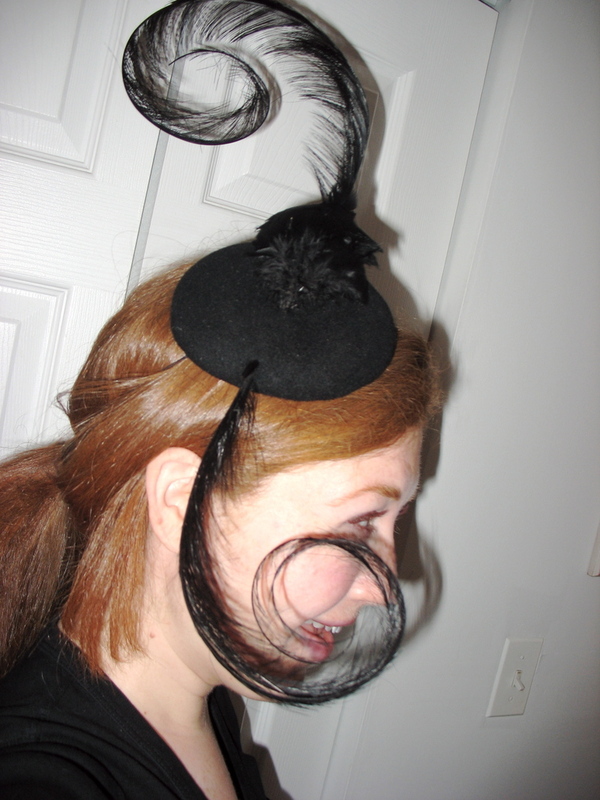 I'd be much more of a hat person if we were living in a more hat-friendly era -- one of the most genius accessories out there! Adds allure AND covers bed head! Embrace the hat baby - it can add so much to a look. And I am judging fom the PDF that this hasn't been published yet, so make haste! There is a spelling mistake in this - Unfazed is spelt as such, not unphased. DUUUUUUUUDE......I LOVE THAT TURBAN! I want one in turquoise. Ok, I'm new to fashion blogs, so excuse my small-town awe. I'm still in love with fashion. The turban looks good but the second hat is even better! The Prada Turban is the new Balenciaga Hat. They are just everywhere. I love the second photo, for some reason I feel like I need to start bringing back the dainty little cap. Madonna has included turbans in her H & M collection. I cannot wait to see all the midwest moms sporting the hat as they meet their friends for daquiris at Friday's. Girls' night! yes, you are wearing a turban, and yes, it is a prada turban (turban as trend seeming strange)..but for some reason there's some sort of non-chalance about the whole look and it works! i wonder if the same vibe could be achieved with your hair worn curly..hmm..
Elizabeth, but, but! It's only a couple times a year the hair is straight. Promis juré! Jen, that's so funny. That reminds me of pictures my sister showed my of the big belt trend at her Florida university. Girls just belting *anything*--tight cotton camisoles from the Express and stuff. Turbans and big belts are not for the faint-hearted! hi! i remember reading this post long ago and my mom has cancer and has lost all her hair and i was telling her about the prada turban... do you know were oh where i can get one for her. she wants one soooooo badly! but i know they were for the spring and im sure they are all gone now but i thought i would take a chance and ask. thank - L ps- i lived in paris all of last year - so i love reading your blog - brings back so many memories! :) i miss it so much! You wrote: "Johnny says 'Check out that girl’s hat' and Chloe says 'It’s a turban.'" Cute kid plus turban for the win! You got there before Mlle. Coppola, when that child on the "L" bonked your head. Sadly, it will be ages before that film reaches my local theater. I regret that you have embraced Twitter. It will be the death of eloquence. Low-tech paleolithic cave-wall paintings are more expressive. My mother, from England, insists on refereeing Santa Claus as "Father Christmas" instead, which answers your "Pere Noel" question.